In many cases, the best way to discover a new cuisine is by it’s spice rack. No other ingredient can help us taste the characteristic flavors of a cuisine quite as easily, immediately tipping us off to the differences between a mild German dish and a spice-packed Indian one. But spices also tell the story of our world—the history of how we’re all connected. As people have brought their flavors with them they've been shared and reinterpreted giving us the various, vastly different global, national, and regional cuisines we love to explore. Today’s journey takes us to the Middle East, where we’ll get acquained with assorted spices and spice blends such as baharat and za’atar, sumac and urfa biber. Even if you don‘t recognize them by name, don’t be intimidated! Once you get to know them, we promise that they’ll enrich your everyday cooking. So let’s get introduced to some of the essential spices of the Middle Eastern pantry, learn how to make homemade spice blends, and see what delightful dishes you can cook with them. Middle Eastern cuisine is all about vegetables, meats (like chicken, beef, and lamb), as well as flatbreads, pita breads, coffee, and tea. But the star in many dishes are spices such as sumac that, until rather recently, are relatively little-known in other parts of the world. The deep red spice has a fruity, tart, and sour taste and is therefore often used as an alternative to citrus fruit juice or vinegar. It’s harvested from Sicilian sumac (also called tanner’s sumach or elm-leaved sumach), a plant that grows small round stone fruits that turn violet-red once fully ripe. At this point, they are dried and crushed into sumac. Sumac is used as a table spice that can be sprinkled on just about every dish you can think of for a tang of vibrancy. It refines chicken, vegetable, and seafood stews, rice dishes, dips, and salads such as fattoush. The Lebanese bread salad, fattoush, is a traditional starter or mezze. Fresh vegetables like tomatoes and cucumbers are paired with parsley and mint and get a nice crunch from crouton-like fried flatbread or pita bread. A classic fattoush dressing includes ingredients such as garlic, mint, lemon juice, olive oil, salt, pepper, and our new, yet incredibly dear friend, sumac. It really makes all the difference when it comes to enhancing the dressing with an intense, unique flavor. We like to sprinkle some more of it on top right before serving! Besides sumac, there’s an almost neverending list of other Middle Eastern spices that you should try. With just a pinch these spices can take dishes to the next level or give recipes that you might be a bit bored with a new twist. Unfortunately, it would go beyond the scope of this article to introduce them all, so let’s start with this small overview of some of the most essential spices of Middle Eastern cuisine. Instead of buying oft overpriced spice blends, it’s worth making them at home. It’s not only more cost efficient, but it ensures that you know exactly what is and is not in the mix, plus it allows you to tweak according to your taste. While it’s best to grind spices with a mortar and pestle, you can rock a knife with a curved edge back and forth over herbs and nuts to chop them—for example, the chef’s knife from the ZWILLING Pro series. Baharat is the Arabic word for ‚spices’ and, accordingly, is one of the most common spice blends in Middle Eastern cuisine. The exact composition varies by region, but it typically contains cardamom, coriander, cumin, nutmeg, cloves, paprika, pepper, and cinnamon. Baharat is often used for grilled dishes–rubbed on meat or used in marinades. You can also use it in rice and vegetable dishes, or even try spicing up coffee with it, a drink called none other than coffee baharat. Originating from North Africa, dukkah is a widely used spice blend in Middle Eastern cuisine and has been conquering the rest of the world in recent years, too. 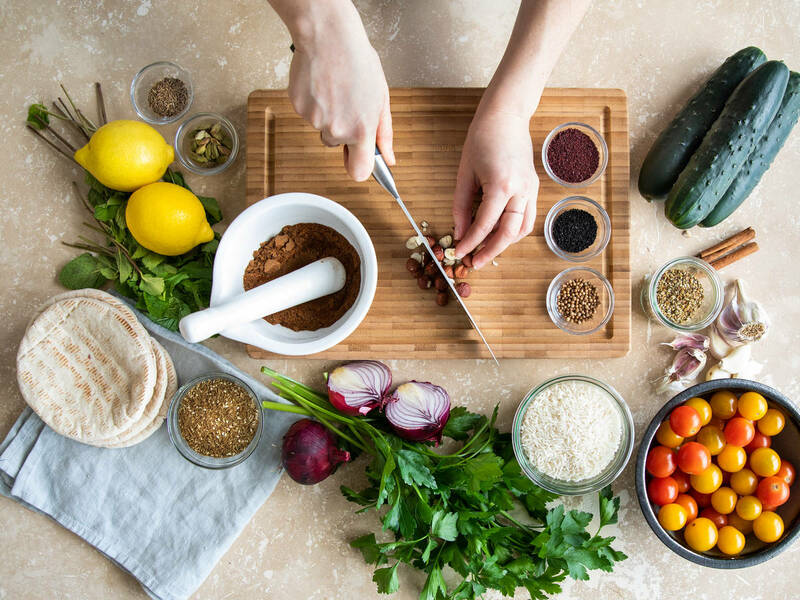 As with most spice blends, some ingredients and proportions change from one family recipe to the next, but with dukkah it’s always about the combination of herbs (mint, thyme, or marjoram), nuts (often hazelnuts, but you can also use cashews), and spices (such as cumin, coriander, fennel, salt, and pepper). Dukkah is often served as a starter with fresh bread and olive oil but can be used to elevate all kinds of dishes. A pinch of dukkah improves lots of dishes by adding a floral crunch. Our recipe for aromatic chicken pilaf is a one-pot-star and a great option for your next weeknight dinner. Onions, garlic, and rice get fried, then simmered in chicken stock until the rice is cooked and fluffy. We add fried chicken, but for a vegetarian option, substitute chicken stock with vegetable broth and add chickpeas, cauliflower, eggplant, or your favorite vegetable. Dried fruits add a sweetness to the pilaf, but dukkah is the true star. Sprinkle a generous pinch over the top and you’ll see what we’re talking about. It’s irresistibly delicious! Za’atar is the Arabic word for thyme–the base of this spice blend paired with oregano, sesame seeds, salt, coriander, and sumac. To make it at home, toast the nuts and seeds, finely grind the spices, and toss everything to combine. Za’atar makes a great addition to dips, marinades, salads, and can be mixed with some olive oil to be brushed on cooked flatbreads, meats, or vegetables. Eggplants are one of the most popular vegetables in Middle Eastern cuisine (you’re probably familiar with baba ghanoush, a pureed eggplant dip). They taste splendid when you roast them in the oven to develop their deep, slightly smoky flavors. Score them first to make sure that they cook evenly and so the za’atar mixture can spread better. While the eggplants roast, there’s enough time to prepare a creamy sesame dip with plenty of fresh herbs. Depending on how hungry you are, you can serve this dish as a starter or a vegetarian main. No matter which spices and spice blends have piqued your interest, here are some useful tips that you can apply to all of them. 1. For homemade spice blends, use whole spices as much as possible and finely grind them yourself with a mortar and pestle or spice mill. Ground spices will most likely have lost quite a lot of their flavor by the time they reach your kitchen. 2. Specific spices, like the ones introduced in this article, can be pretty expensive in supermarkets— depending on where you’re living. It’s often cheaper to search for them in specific, specialty supermarkets or even purchase them online. 3. Roast nuts and seeds in a dry frying pan before using them—no oil or fat needed! This helps to develop their flavors in the best way before grinding. 4. Store spices and spice blends in airtight containers in a cool and dark place. Moisture, sunlight, and heat are the enemy when it comes to storing spices! 5. Even though spices will generally never grow moldy, they most definitely can still go bad—losing their flavor over time and even turning rancid. That’s why it’s better not to buy too large of quantities and try to use them within 2 years (for whole spices, 6 months for ground spices). It helps to put stickers on spice containers so you can keep track of when you bought them. When looking for Middle Eastern spice pastes, here are our three favorites: zhug (a hot sauce made with cilantro, chili, garlic, and more spices), harissa (a hot chili pepper paste), and filfel chuma (a chili sauce made from sweet and hot peppers and garlic). On the other side of the flavor spectrum, there’s no way around rose and orange blossom waters in many Middle Eastern desserts. Rose water is produced during the distillation of rose oil and refines desserts with its floral and fruity notes–you can taste and smell it! In Middle Eastern cuisine, it’s especially popular for dairy-based sweet dishes, such as malabi—a sweet milk pudding. Malabi, or muhallebi, is a refreshing cool dessert that’s easy to prepare. Start by mixing starch with some of the liquids, then combine it with the remaining milk, heavy cream, and rose water. Heat while stirring until the mixture thickens. Then fill the milk pudding mixture into glasses and let rest in the fridge. Right before serving, pour over some pomegranate syrup and sprinkle with chopped pistachios, edible rose buds or petals, and ground cardamom. Trust us–this one is a keeper and incredibly distinctive dessert that your friends and family will love.